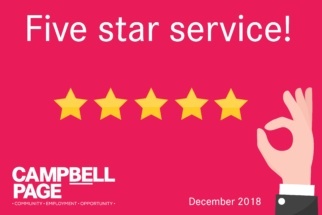 We’re providing 5 star service in Bega and Ulludulla. Moruya and Wollongong are close behind with 4 stars. Finding work can be serious business. Let us help you find a future you can smile about. We’ll assist you in all aspects of your job hunt. From helping you identify what you are good at, to creating your resume, enrolling you in training, preparing you for interviews and providing ongoing support. Whatever challenges you might be facing, we are dedicated to helping you find your brightest future. Provide you with help along the way, even while you are employed. Don’t go it alone. Find out how we can help you on your journey to long term employment. Connect with your local Campbell Page hub today. Campbell Page is nationally accredited under the jobactive program services. We comply with the Australian Government’s Employment Services & Program Service Guarantees. For more information view our Governance information.